About 30 years ago, astronomers realised that the Sun resonates like a giant musical instrument with well-defined periods (frequencies). It forms a sort of large, spherical organ pipe. The energy that excites these sound waves comes from the turbulent region just below the Sun's visible surface. Observations of the solar sound waves (known as "helioseismology") have resulted in enormous progress in the exploration of the interior of the Sun, otherwise hidden from view. As is the case on Earth, seismic techniques can be applied and the detailed interpretation of the observed oscillation periods has provided quite accurate information about the structure and motions inside the Sun, our central star. It has now also become possible to apply this technique to some solar-type stars. The first observations concerned the northern star eta Bootis. Last year, extensive and much more accurate observations with the 1.2-m Swiss telescope at the ESO La Silla Observatory proved that Alpha Centauri , a solar "twin", behaves very much like the Sun, and that some of the periods are quite similar to those in the Sun. These new observational data were of a superb quality, and that study marked a true break-through in the new research field of "asteroseismology" (seismology of the stars) for solar-type stars. But what about other types of stars, for instance those that are much larger than the Sun? Based on an extremely intensive observing project with the same telescope, an international group of astronomers  has found that the giant star xi Hya ("xi" is the small greek letter ; "Hya" is an abbreviation of "Hydrae") behaves like a giant sub-ultra-bass instrument . This star is located in the constellation Hydra (the Water-Monster) at a distance of 130 light-years, it has a radius about 10 times that of the Sun and its luminosity is about 60 times larger. The new observations demonstrate that xi Hya oscillates with several periods of around 3 hours. xi Hya is now approaching the end of its life - it is about to expand its outer envelope and to become a "red giant star" . It is quite different from stars like the Sun, which are only halfway through their active life. xi Hya is considerably more massive than any other star in which solar-like oscillations have so far been detected. This observational feat allows to study for the first time with seismic techniques the interior of such a highly evolved star. It paves the way for similar studies of different types of stars. A new chapter of stellar astrophysics is now opening as asteroseismology establishes itself as an ingenious method that is able to revolutionise our detailed understanding of stellar interiors and the overall evolution of stars . Helioseismology (seismology of the Sun) is based on measurements of the changing radial velocity of the solar upper atmospheric layers (the "surface") by means of the well-known Doppler effect, as this surface moves up and down during acoustic oscillations. The corresponding amplitudes are very small, with velocities of up to 15 - 20 cm/sec, and the typical period is around 5 minutes. Therefore the phenomenon was first known as the "five-minute oscillations". Intensity measurements have also been tried, but the noise level is larger than for velocity data due to the presence of "granulation" (moving cells of hot gas) on the solar surface. In the case of larger and brighter stars like the giant stars, the corresponding amplitudes and periods increase. For instance, theoretical predictions for the giant star xi Hya have indicated that velocity amplitudes of about 7 m/sec and periods of the order of 3 - 4 hours could be expected. Observations of such oscillations are much more difficult, because the demands on the performance of the spectrograph increase dramatically, as this timescale is similar to that of variations of conditions in the Earth's atmosphere during the observing night. Spurious instrumental effects, like mechanical flexure, would be detrimental to such demanding observations. However, the experience from the search for exoplanets orbiting other stars - by observing the periodic change in velocity of the parent star due to the weak pull of the orbiting planet over even longer timescales - has proven to be very useful. Indeed, asteroseismology has benefitted greatly from the development of accurate techniques now employed in the search for exoplanets . An international team of astronomers  observed xi Hya with the Swiss 1.2-m Euler telescope at the ESO La Silla Observatory (Chile). They used the CORALIE spectrograph, which is well known for numerous discoveries of exoplanets (cf. ESO Press Release eso0114), and recently for the detection of 7-min acoustic oscillations in the solar-twin star Alpha Centauri A (cf. ESO Press Release eso0125). The same technique that delivered superb observations of Alpha Centauri A was employed to investigate the oscillations of xi Hya . The sound waves make the surface of the star oscillate periodically in and out, and the CORALIE spectrograph measures the velocities of the up-down motion. As xi Hya is a giant, these waves need more time to propagate through the stellar interior up to the stellar surface than they do in a solar-like star. Thus, the generated oscillations of the surface are slower. An observing campaign lasting no less than one full month, taking about two measurements every hour was necessary to detect the tiny movements of the surface of xi Hya . The detected oscillations have periods of about 3 hours, and have speeds of only up to 2 metres per second . This is somewhat smaller than expected, but the predictions for these amplitudes were very uncertain as the conditions in xi Hya are so very different from those in the Sun. ESO Press Photo eso0215 shows the frequency spectrum of xi Hya, based on these extensive observations. The "power peaks" indicate the frequencies of the oscillation of the stellar atmosphere. The broad distribution means that several different sound waves are clearly present. This is the first time such a spectrum has ever been obtained for a giant star. A first analysis showed the presence of about one dozen significant frequencies and correspondingly, periods . Among those, four have amplitudes above 1 metre per second. In addition to these twelve frequencies, others appear to have been detected as well, but with less certainty and their reality must be confirmed by a subsequent, more detailed study. The "sound of xi Hya" has been synthesized in PR Audio eso0215. A good model of the star is necessary before the observed oscillation frequencies (periods) can be properly interpreted. Current models of the Sun are accurate and represent a typical main-sequence star at midlife, and the oscillations are well understood. 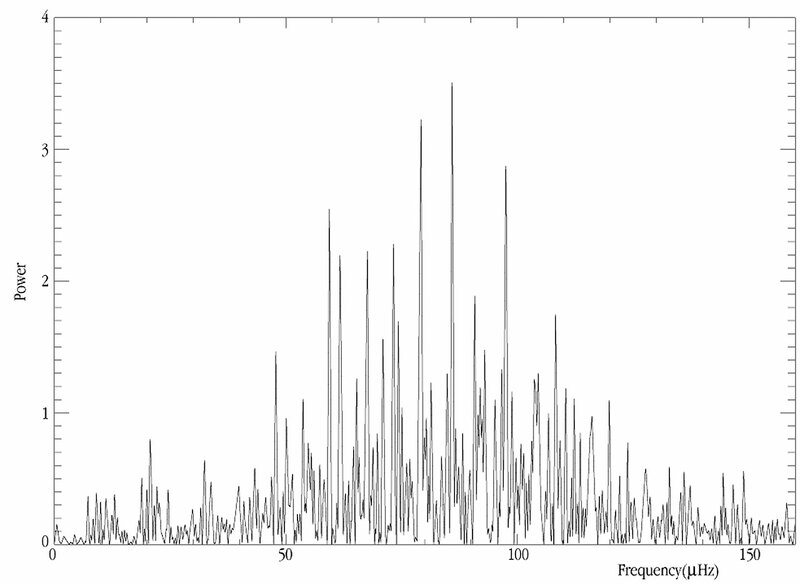 The sound spectrum corresponding to the full disk - i.e., what we would observe if the Sun were as distant as other stars and we would therefore see it as a light point in the sky - shows a regular pattern in which the observed frequencies are separated by two different and constant intervals, the "large" and the "small" separations. It is much more difficult to "model" the interior of a giant star as the core has changed a lot during the evolution of the star. The nuclear fuel has been exhausted, the stellar core has contracted and the envelope has expanded substantially . The resulting sound spectrum has therefore also changed considerably. 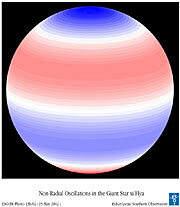 Now there is only a small group of oscillating modes that display the same regular pattern as seen in the Sun. They are the radial modes, pressure modes that correspond to a radial expansion and contraction of the star (up and down motion of the surface). The modes in the Sun are sound waves for which most of the oscillation energy is concentrated in the outer parts of the Sun. In stars as highly evolved as xi Hya, they partly take on the character of gravity modes in the interior of the star. Gravity modes are oscillations that move matter up and down in the gravity field, under the influence of buoyancy, with only small changes of the pressure. 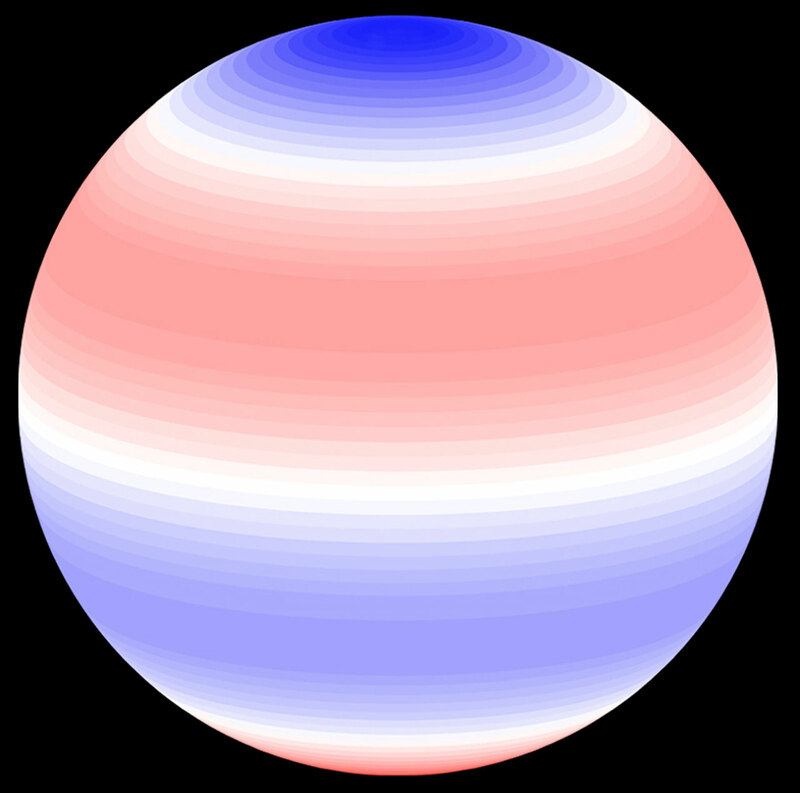 This is the same effect that makes an air-filled ball pop to the surface when released under water. Gravity modes are normally trapped in the stable interior inside the upper (convective) envelope of a star. So far gravity modes have not been detected in the Sun. In a giant star, however, there is a chance to see some, because some of the oscillations have a mixed character : they behave like gravity modes in the interior and like sound waves in the envelope. The high-resolution spectra of xi Hya were also used to determine improved values of the fundamental parameters of this star: its temperature is 4950 ± 100 K, the mass is 3.31 ± 0.17 times that of the Sun, and the age is 276 ± 21 million years . These values may be refined in a subsequent, more extensive analysis. With this improved model for xi Hya, the astronomers calculated the frequencies of all oscillations likely to be observed. As in the Sun, the radial modes are expected to be the dominating ones. In fact, three out of the four modes actually observed in xi Hya coincide within the errors with the predicted radial modes. The fourth mode seems not to be radial, but agrees with a non-radial mode with 2 or 3 wave peaks and valleys over the surface. ESO Press Photo eso0215 provides a graphical illustration of this in the case of a star seen almost equator-on. Some of the observed lower-amplitude modes must be mixed non-radial modes, since more modes are detected than can be accounted for by the radial modes of the models alone. Moving directly from stars of about one solar mass to the giant star xi Hya is a rather great leap. With the CORALIE and HARPS instruments (the latter soon to be installed on the ESO 3.6-m telescope at La Silla), an entire sequence of stars at different evolutionary stages will be observed next: from newly born to middle-aged stars like the Sun, and also old ones that are near retirement. The new observations of xi Hya show that this is now technically feasible. Once more stars have been observed, changes in the interior structure and composition can be followed and current theories of the internal stellar structure can be verified and improved. Clearly, asteroseismology is bound to have a major impact on the understanding of stellar evolution . The detection of oscillations in the giant star xi Hya also has implications for the target selection of several space missions aiming at seismic measurements: the Canadian MOST mission, the French-led European COROT mission (with launch expected in 2005), and some that are still under consideration, as the Danish Rømer mission (now in the detailed design phase) and the ESA Eddington mission. The present observations have proven that these space missions will be able to observe oscillations in a wide range of stars, and thus will constitute a major new source of detailed information about the interior of stars, not accessible from the ground. The team consists of Conny Aerts and Thomas Maas (Dept. of Physics and Astronomy, Catholic University of Leuven, Belgium), Fabien Carrier, Michel Burnet, Jose de Medeiros and Francois Bouchy (Geneva Observatory, Switzerland), Søren Frandsen, Dennis Stello, Hans Kjeldsen, Teresa C. Teixeira, Frank Pijpers, Jørgen Christensen-Dalsgaard and Hans Bruntt (Dept. of Physics and Astronomy, Aarhus University; and Theoretical Astrophysics Center, Aarhus University, Denmark). Some HTML-browsers support character entities for greek letters - "xi" is then represented by "ξ" . In astrophysical terms, xi Hya is currently in the hydrogen shell-burning phase, having left the main sequence some time ago and now near the sub-giant/giant border. The results described in this Press Release are about to be submitted to the research journal Astronomy & Astrophysics (Letters) by the present team.